When it comes to appetizers, there is one dish that almost every Italian keeps in their recipe arsenal: crostini. Meaning "little toasts," the warm, slightly crunchy slices of bread can be whipped up in a matter of minutes and topped with just about anything, from juicy heirloom tomatoes in the summer to earthy mushrooms in the fall. However during spring, we're all about the greens: asparagus, fava beans, and ramps could all be potential crostini toppers. 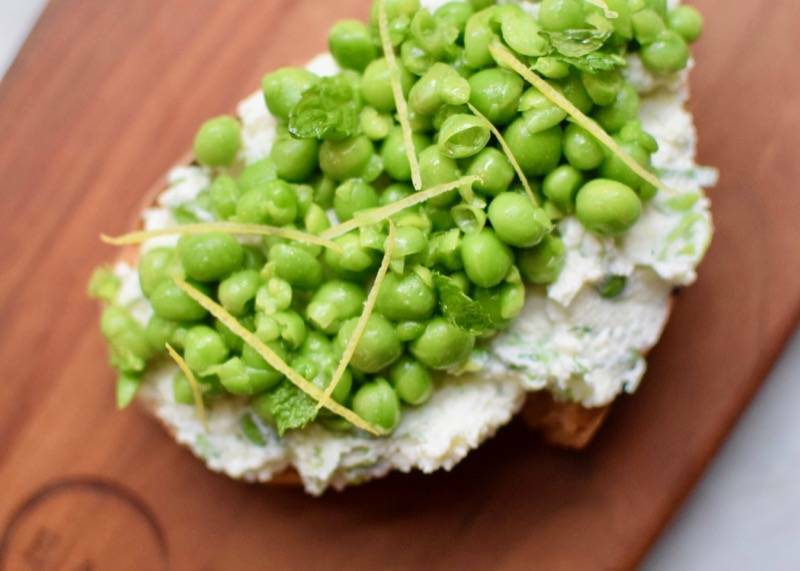 In this recipe, we've dressed up delicate spring peas with fresh mint, lemon zest, and extra virgin olive oil, using a spread of ricotta cheese as "the glue" to hold the peas on top of each crostini slice. The result? A crunchy, creamy, and zesty antipasto perfect for a springtime gathering or picnic. Toast slices of bread. Just before serving, spread about one tablespoon of ricotta cheese on each slice. Carefully spoon pea mixture on top and garnish with a few mint leaves. Drizzle each with extra virgin olive oil and sprinkle a pinch of Maldon sea salt.